Monash marches with pride again in 2019! 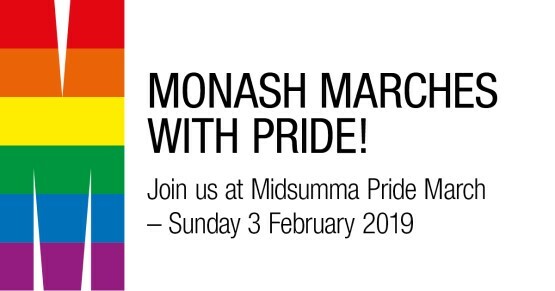 March with Monash in the 24th Midsumma Pride March! Pride March recognises and celebrates Victoria's LGBTIQ community as part of the iconic Midsumma festival, Melbourne’s annual Queer celebration. All Monash students and staff are invited to join us march on Sunday 3 February. This will be the fourth year that Monash has attended Pride March. So let's march together and show that Monash is a fierce ally of the LGBTIQ community.